Crystal Palace say they are "surprised and disappointed" that their FA Cup third-round tie with Brighton has been scheduled for a Monday evening after raising concerns about the game being played at night. Brighton will play rivals Palace on 8 January at 19:45 GMT after the game was selected for live television coverage. 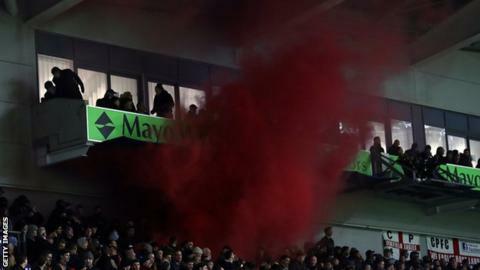 There was crowd trouble when the sides met in the Premier League last month. "We understand the security concerns," Palace said in a statement. "And the safety of all supporters must be paramount. Palace have been allocated 2,000 tickets for the match, considerably fewer than the club feels is appropriate for the match. "We should be entitled to more than 4,600 tickets under normal FA Cup rules." the statement continued. "We were told that the incidents which took place at last month's league match were caused, in part, by fans with tickets colluding with un-ticketed fans to force entry into the stadium. "We strongly believe that the very small minority who misbehave and create disorder should be punished to the full extent of the law, thereby deterring others. Brighton's cup tie with Crystal Palace will be the first competitive club match in England in which VAR (Video Assistant Referee) technology will be used.